After you’ve laid your turf you need to look after it so that is flourishes. 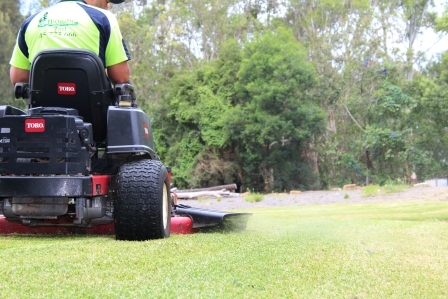 Here are some tips from the experienced Sydney turf suppliers at Hi Quality Turf. How you water your newly laid turf in the first four weeks after laying can make or break your lawn. As soon as your turf is laid you should give it a deep watering. This one should be extra long, allowing the water to soak through the turf and into the top layer of soils. This helps the root system to bind with the soil and is essential for encouraging your lawn to establish itself. A new lawn can lose moisture at an alarming rate, and can die rapidly if mistreated. The first month after your turf is delivered and laid is a constant battle to keep it damp enough. Failure to win this battle can lead to your lawn deteriorating or dying. For the first four weeks or so, your new turf should be watered almost constantly. 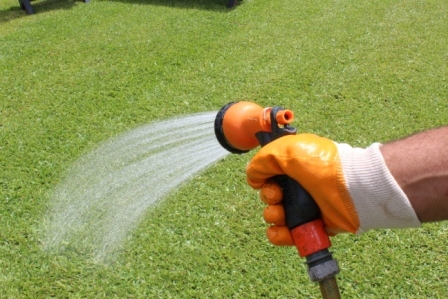 During the first week your lawn will need around 25 millilitres of water each and every day; this can be scaled back to every second day for the second week and a little more for the third and fourth. After the first month, your lawn will be starting to establish itself. But it takes up to 12 months for a deep root system to develop and, until then, you need to keep a close eye on your lawn and water it regularly. The exact watering regimen you should follow will vary between different types of grass. But as a general rule, water your lawn infrequently – once or twice a week in summer, much less in autumn and winter – but for a long time. Deep, infrequent watering encourages strong root systems and more drought-resistant grass. As long-time turf suppliers in Sydney we have seen the results of watering too much or too little, and they aren’t pretty. For the first month, don’t mow your new lawn at all. After around four weeks it will be strong enough for its first cut, but don’t mow too low. Aim to only trim about a quarter off the length of the grass during early mowing. Gradually increase to the appropriate level for your type of grass as the lawn matures. Regular mowing keeps a lawn healthy and discourages weeds. But don’t overdo it – your lawn should never be cut too short, especially in hot weather. Turf suppliers in Sydney know that very short grass can’t retain moisture as well and can turn yellow, wither, or even go into shock, leading to root stoppage. Don’t crop grass by more than a third in any single mow. If your lawn has been left for a while and become unruly you will have to reduce it to the desired length slowly. Cut off a third, leave your lawn for a few days and cut off another third, and so on until it is down to the right length. Even though wet weather will encourage growth and make you want to cut your lawn, always wait until the grass has dried first. Mowing a wet lawn can clog up your mower and increase the chance of rust. Mowing when the ground is soft and wet can also damage the grass or the soil’s integrity. We have been Sydney turf suppliers a long time, and we know that despite your best efforts to remove all weeds before turf laying, you will inevitable get weeds at some point. It could be a minor incursion of clover or something more serious, but either way you’ll want to get rid of it. For minor weed infestations you can simply pull them out by hand, making sure to get all the roots. This is cheap but time consuming, and depending on the type of weed, it may not be enough. Another method is to spray a herbicide that will stick to the weed and kill it completely. You’ll need to work out which type of herbicide is best based on the type of grass you have and the type of weed you wish to remove. When choosing a herbicide it is very important to understand the difference between selective and non-selective varieties. A selective herbicide is able to recognise the difference between the weeds you are eradicating and the grass you wish to keep. 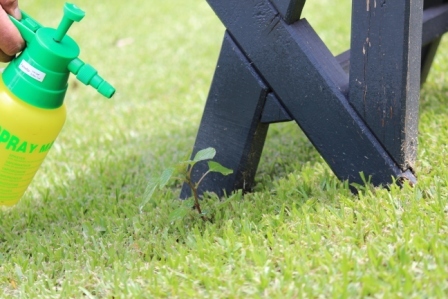 These herbicides will kill the weeds and leave your lawn alone. Non-selective herbicides, on the other hand, will kill whatever you spray them on. You should only use a non-selective weed killer if you have no other choice or are clearing an area for a new garden or lawn. Most types of grass need feeding two to three times per year to keep them lush and healthy. But don’t just fertilise when your lawn looks bad, or when the urge takes you, follow a responsible soil management plan. 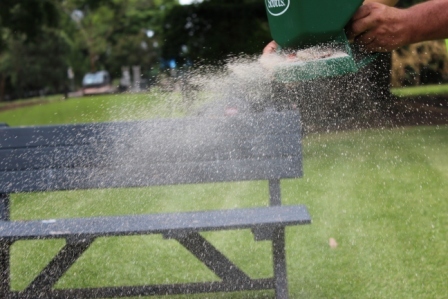 The optimal times to fertilize your lawn are early spring, early summer, and mid-autumn. Fertilizing in mid-autumn gives your grass the nutritional foundation it needs to start growing quickly in spring. The trade-off with fertilizing is that a more vigorous lawn requires more mowing, but it will also have better colour and healthier roots. The key to maintaining a healthy, environmentally friendly lawn is feeding it just the right amount of nutrients for healthy growth without over-feeding. This can be achieved with either organic or conventional fertilizers, as plants will get the same nutrients however they are delivered. The key ingredients in any good fertilizer will be nitrogen, phosophorous, and potassium. Nitrogen promotes healthy green foliage while phosphorous develops strong roots, and potassium improves the plant’s overall strength and disease-resistance. Of these nutrients, nitrogen is the most important. In fact, the amount of fertilizer you need to use will depend largely on the percentage of nitrogen it contains. You can find the percentages of each nutrient easily on fertilizer packaging. There should be three numbers on the packaging representing percentages for nitrogen, phosphorous, and potassium, in that order. Good fertilizers for the types of grass used for turf should contain between 12-25% nitrogen, with smaller amounts of the other nutrients. Alway use a spread to ensure your lawns gets an even distribution of fertilizer. Always follow the instructions on the packaging – these may differ from brand to brand, so check even if you’ve done it before. Make sure you always water in fertilizer if instructed, otherwise it could burn your lawn. Hi Quality Turf is the Sydney turf supplier of choice. Contact us today on 1800 887 258 or enquire online for more information about lawn care or to get started on your lawn installation project.